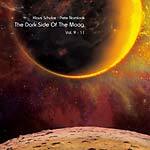 "Complex re-release of the most remarkable and worldwide sought after series The Dark Side Of The Moog by German electronic pioneers Klaus Schulze and Pete Namlook (aka Peter Kuhlmann) in three slip lid boxsets, each with 5 CDs, incl. bonus material and new linernotes. The third box contains Vol. 9 to Vol. 11 and two bonus CDs. The relationship between Klaus and Pete and the exchange of ideas was unorthodox from the beginning of their co-operation, in that they rarely met personally. The most remarkable contacts they had were outside of their studios, for instance their concert of April 1999 at the Jazz Festival in Hamburg, which was released as an edited version on Dark Side Of The Moog, Vol.8 - the interplay and chemistry between them is clearly evident, and it becomes even clearer on the un-edited version of the concert. The influence Namlook had on Klaus's music in the middle of the nineties should not be taken lightly, because although Klaus dearly loved those early-analogue elements from his own music, they had become, to an extent, lost. It was Pete who fortified him to go back to the analogue charm of his early albums and it was Pete who supported him in the modification of his analogue instruments, leading finally to the epoch-making Schulze album from 1996 - Are You Sequenced?. And so a legendary series of recordings was born. 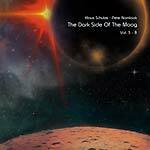 Dark Side Of The Moog grew more or less unplanned to a sprawling, stately-sized series of eleven volumes recorded between 1994 and 2008, only ending with the early, tragic death of Pete on November 8th 2012." 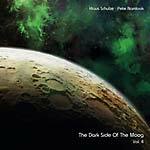 "Complex re-release of the most remarkable and worldwide sought after series The Dark Side Of The Moog by German electronic pioneers Klaus Schulze and Pete Namlook (aka Peter Kuhlmann) in three slip lid boxsets, each with 5 CDs, incl. bonus material and new linernotes. The second box contains Vol. 5 to Vol. 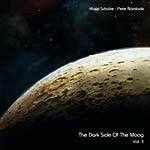 8 and a bonus-CD with Klaus Schulze-tracks exclusively remixed by Pete Namlook. The relationship between Klaus and Pete and the exchange of ideas was unorthodox from the beginning of their co-operation, in that they rarely met personally. The most remarkable contacts they had were outside of their studios, for instance their concert of April 1999 at the Jazz Festival in Hamburg, which was released as an edited version on Dark Side Of The Moog, Vol.8- the interplay and chemistry between them is clearly evident. The influence Namlook had on Klaus's music in the middle of the nineties should not be taken lightly, because although Klaus dearly loved those early-analogue elements from his own music, they had become, to an extent, lost. It was Pete who fortified him to go back to the analogue charm of his early albums and it was Pete who supported him in the modification of his analogue instruments, leading finally to the epoch-making Schulze album from 1996 - Are You Sequenced?. And so a legendary series of recordings was born. Dark Side Of The Moog grew more or less unplanned to a sprawling, stately-sized series of eleven volumes recorded between 1994 and 2008, only ending with the early, tragic death of Pete on November 8th 2012."